Our Physical Therapists have a unique approach to patient care; solving the patient puzzle with thorough examination and using complementary techniques to make the treatment the most effective and lasting. We pride ourselves on successfully finding and treating patients problems where others have previously failed. This approach can be considered “back to basics”, which necessitates one on one focus and attention to detail. Although this is not overly complicated, it is something that other practitioners are unable to provide when treating multiple patients at once. We have seen time and again patients getting quick and sustainable results with this approach even after having spent months or even years pursuing treatment from other practitioners where “there was always just something missing”. There are mainly four ingredients to getting a successful outcome. When done alone, results, if any, are temporary. When done together, results are exponentially improved and lasting. Our Physical Therapists are uniquely trained to provide all of these components in each treatment session throughout the stages of recovery. 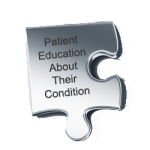 Patient Education About Their Condition: Just as is said about history, the same can be said about painful conditions and injuries; those who do not understand it are doomed to repeat it. After a thorough evaluation and throughout the course of care, we believe it is imperative to take the time to help patients understand the condi-tion. By doing so, the patient is at the center of the care and can help set and will be guided how to work towards their personal goals . Along the way patients quickly learn how to manage their symptoms during the times when they are not in PT. This allows for more carry over between sessions so that the Physical Therapist can progress the program and recovery along more quickly. This results in improved performance, fewer visits, less discomfort, decreased costs, and lasting relief. 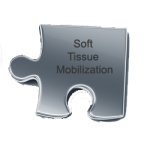 Soft Tissue Mobilization: Physical Therapists perform soft tissue mobilization to loosen adhesions, break up scar tissue, release trigger points, reduce swelling and improve blood flow to initiate tissue healing. We use manual techniques as well as Graston™ and /or Trigger Point Dry Needling techniques to effectively treat soft tissue dysfunctions. Soft Tissue Mobilization works exceptionally well when done before joint mobilization and strengthening as it prepares the tissue to perform. 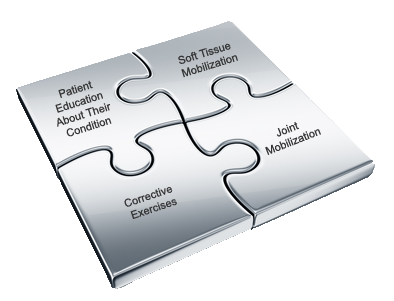 After the tissue has been properly mobilized or released, then treatment with joint mobilization or corrective exercise provides a lasting effect. When done alone, the soft tissue does not stay loose for long, as there has been no changes to the joint misalignments or strength imbalances. We have become used to hearing patients tell us that their previous practitioners would often skip this step entirely or just do a very superficial treatment. This had been why they were getting limited results. Patients are amazed to see results during their first visit with us after the soft tissue restrictions are addressed. 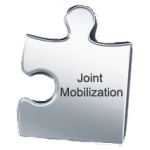 Joint Mobilization: Often thought only to be done by chiropractors, physical therapists are well trained in spinal and peripheral joint mobilization and manipulation. This improves postural alignment not only in the spine but also the shoulders, elbow, hand, hips, knees and ankles. Restoring correct postural alignment with the use of joint mobilization or manipulations will reduce strain on muscles, tendons and ligaments, restore normal joint motion and reduce painful pressure on nerves. 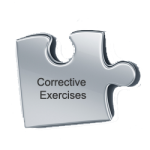 Alt-hough joint mobilization and manipulation may provide relief, the realignment is temporary if the soft tissue is not released prior or the muscles around the joint are not strengthened to hold the new position after.